Update: The Principal, Dr. Ali, has called for a special, “pre-LSC” meeting for this Friday, October 16th at 8am. Incredibly, this has been done in violation of the rules that the LSC community relations officer, Luis Garcia, explicitly stated at a special training held just weeks ago. This is not the first time this has happened and is indicative of a divide and conquer approach to meetings in my experience. For once I will not be able to attend. More importantly an unscheduled LSC meeting can only be called by the LSC President or 4 LSC members…, you know, checks and balances. Dr. Ali has refused to provide the names of the members who have called this meeting. As was the case when he threw the press out of a public meeting and unilaterally canceled our August meeting, our principal is showing a blatant disregard for the rules of the LSC of which he is obliged to be member. I have notified the community relations officer, Luis Garcia-Juarez, and the network chief, Minerva Garcia-Sanchez, of these irregularities and await their action. Apologies. Work, P.E.R.R.O., the LSC meetings, a 75-mile bike ride from Pilsen to Bong Recreational Area, and an autumnal wedding season have kept me busy these last few weeks. A few of weeks ago we had our first official LSC meeting with quorum. After nearly three months without quorum we had a lot to do. In addition to our regular business, we scheduled our next meeting (3:15pm on October 20th), and voted in 3 new members. Since then I’ve been informed that another member of the LSC, non-teacher staff representative Margarita Ugarte, is in danger of losing their job. Again, I feel this is was way too much drama for an elementary school. I’d much rather be writing about Bach’s Canons, my fantasy football drafting algorithm, or the CUBS!!! But as the community representative on the LSC, I feel compelled to keep the community up to date given the happenings of the last three months. Here are the details, from my perspective. I don’t have the power to speak for the LSC as a whole and I wouldn’t pretend to. The opinions here continue to be mine and mine alone. The LSC has enough members to hold regular meetings and we have recently received more training from the community relations officer (CRO) on how to conduct the cumulative principal evalution that we need to do this year before deciding on the principal’s contract renewal. I thought things would settle down, but no. I was recently informed that Margarita Ugarte, the LSC’s non-teacher staff representative, has received 2 complaints since May from the principal and his staff. These complaints started almost immediately after the principal evaluation took place in April. This is unfortunately a replay of what happened with Miguel and David. Even more unfortunate is that Margarita is less visible in the school, but has been an equally strong member of the LSC. I hope the community will support Margarita through these allegations in the same way as they have supported Miguel and David. I even hear the principal is talking about challenging my eligibility for the LSC. Apparently, he is claiming that after my move this summer, I don’t live in the district. 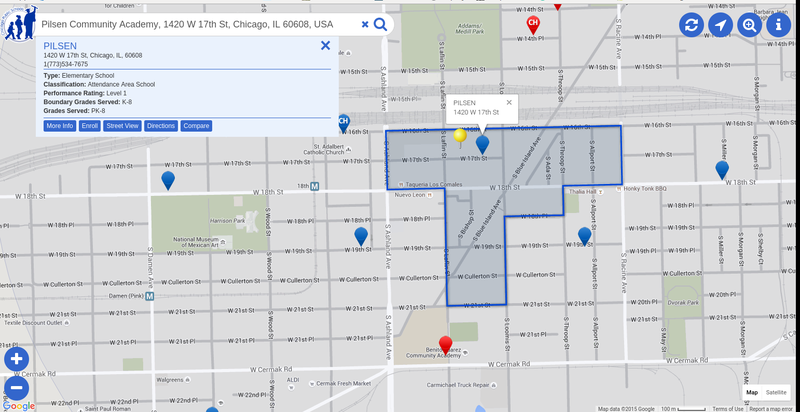 Here’s the map for Pilsen Academy from CPS. If you’ve been to my new apartment, you know that I live in the shaded area. He’s got my address. So… What’s a principal to do after all of his employees on the LSC have quit, been “laid-off”, and fired? Apparently come after me. Stay tuned. Now on to the last meeting. To vote and take action on any agenda item, the council needs 7 members present. A full council has 12 members: 6 parents, 2 teachers, 1 non-teacher staff representative, 2 community representatives, and the principal. We had one parent vacancy (for all of) last year (11). In June, we voted off the other community representative who had been absent for most meetings (10). Additionally, two of our parents’ children graduated, so they were no longer eligible (8). In July, one of the teacher representatives resigned (7). A parent was unable to make the July meeting at the last minute for personal reasons, so we were lacking quorum at 6 members. In August, despite the fact that rescheduling a meeting requires a vote, the principal unilaterally canceled the meeting that was to be the remaining teacher rep’s last (6). Without 7 members we had no quorum and had to wait until the teachers elected two representative at the end of September to do anything. Getting back to quorum was interesting. In the room for our September 21st meeting we had the LSC community relations officer (CRO) to provide guidance on procedure and the deputy network chief (the principal’s boss’s deputy) taking notes. Additionally, the teacher who had resigned from the LSC in July had decided to un-resign some time before the teacher election. Surprisingly, this teacher took his usual seat at the LSC table (7). Equally surprising, Miguel Salgado, the ousted teacher representative, showed up with a letter from the CPS legal department citing the Illinois School Code and Board Rules. They stipulated that he was still a member of the LSC until a hearing was scheduled and held (8). This meant that the election for a new teacher representative was null and void. In a moment of high drama, the CRO called the two teachers out into the hallway individually. As the CRO later explained to the crowd, the teacher who had resigned was not able to un-resign (7). No take-backsies on the LSC. Additionally, the School Code that Miguel and the Legal Department cited was deemed valid. This caused the crowd to stir and the meeting finally began 25 minutes late. There seemed to be general confusion about the process. The principal suggested that we get a temporary president to conduct the meeting, he then attempted to appoint a temporary president only to be corrected on the procedure by the CRO. It was then suggested that we reorder the agenda to elect new members to board prior to voting on the offices of president, vice president, and secretary. After the new/temporary president got the hang of conducting the meeting and the CRO described a valid procedure for avoiding a lengthy voting procedure, we elected two new parents, Maria Gonzalez and Paloma Alvarez, to the LSC (9). We did not vote for a couple of parent applicants and there remains a vacancy. We then elected another community representative. Vicky Lugo applied for the position. You might remember her as being the Pilsen Alliance member who facilitated a donation with the principal to the school along with a Pilsen Alliance employee. Following that meeting, the Pilsen Alliance employee got a full-time job from the principal and she went from being very critical of the principal to being very supportive of the principal. She was also voted onto the LSC immediately prior to the principal evaluation. Two months later she became ineligible due to her child’s graduation. She didn’t receive any votes this time. Note: Since I wrote that last piece, she’s gone back to being very critical of the principal. As the Pilsen Alliance leadership has done in the past, she even stole one of my lines and one of Elvira/Miguel’s lines. (Every time I highlighted that it’s inappropriate for the principal to be yelling at the parents of the LSC, I would tell them, “We’re his boss.”) The rest of that Pilsen Alliance story is for another time. Elvira Velazquez, the previous LSC president whose child graduated last year, also applied for the community representative position and was voted in (10). She received 7 of the 9 votes, with 2 abstentions. The principal abstained from almost every vote during the entire meeting. We then voted on president, vice president, and secretary positions. Leti Garcia was voted as president, Elvira was voted in as vice president, and I was voted in as secretary! I was not prepared for the honor, but accepted. I promise that those notes will be less colorful than the ones found here. Time to let my 80 words-per-minute typing skills shine! In addition to the uneventful regular business, we put/maintained the cap on unsupervised spending by the principal at $5000. Last year, the LSC raised it to $10,000. We also set the regular date for the meeting and moved it from 8 am to 3:15 pm in an effort to encourage and allow the school’s teachers to show up. Finally, parents who had showed up to make public comments and ask the principal questions had their chance after a 3 month delay to our 3 hour meeting. One parent asked how many teachers Principal Ali had fired. The community relations officer (CRO) stepped in and said that the decision to let go of personnel was made by CPS, not the principal. This was surprising to me. Every time prior to this, the principal had claimed the credit for getting rid of bad teachers. I could speculate as to how they are both right, but this post is already too long. The parent then rephrased the question to ask how many teachers had been let go. Answer: Just the 2 Salgado brothers. Lastly Vicky Lugo asked some questions. It was like the old days… the ones after she stopped being critical of him, but before she started up again. She served up some softballs for him. If I recall correctly, the conversation was of the form, “Isn’t it true Dr. Ali that…” Ali would respond, “That’s a good question Vicky. Yes it is true that…” Protip: You want to be skeptical of questions from the crowd at events attended by members of Pilsen Alliance. They’ve always got people in the audience with canned questions.